My guess is that the news media track air traffic control chatter and when the pilot of our flight declared an emergency, the news editors instantly know something is going on and are eager to get video and photos. This is what I call Newsjacking: the art and science of injecting your ideas into a breaking news story to generate tons of media coverage, get sales leads, and grow business. When your content is in demand by the news media, it is all about now! After we landed back at Logan Airport, American Airlines readied another airplane, transferred our bags, and we re-boarded. While waiting for the aircraft door to be closed, I answered several media requests to use my photo. Upon landing I did a standup interview for ABC-TV that aired on the local Boston station as well as the national evening news. Throughout the day there I received more requests on email and Twitter from CBS-TV, NBC-TV, ABC-TV, WBZ-TV, WPIX, Boston25, The Weather Channel, USA Today, New York Post, and others. You can see many of the requests in the @ replies on this tweet. The story even made ABC World News Tonight. Yes, newsjacking can get you on national news broadcast! You just need to get your content out when reporters and editors are looking. 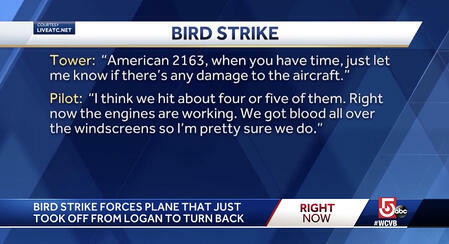 Fortunately, our air emergency was handled skillfully by the American Airlines pilots. Nobody was injured (except the poor geese who never had a chance). The ground staff did a fabulous job getting us to New York with minimal delay. And I had a fun day of newsjacking. 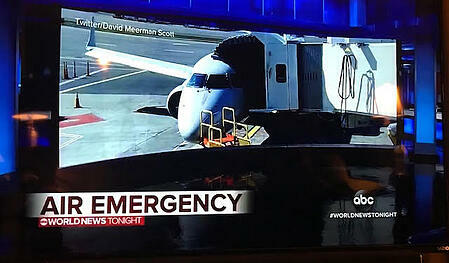 Thank you to Kenneth Kinney for sending me a photo of the ABC-TV World News Tonight broadcast with my photo.